So, what’s the point of an atlas — imaginary or otherwise — without maps? I’ve enjoyed making fantasy maps for a long time, and I’ve done a lot of them. However, it has been quite a while since I’ve made one, and I’ve been fiddling around with Imaginary Atlas for years trying to come up with something. I finally decided just to do it. Just do it, dammit, and stop hemming and hawwing. Just do it and don’t worry that the map doesn’t make my imagination tingle the way so many of the others did. I can always change it later. I’ve done that before. I can do it again. But I have to get something to start. 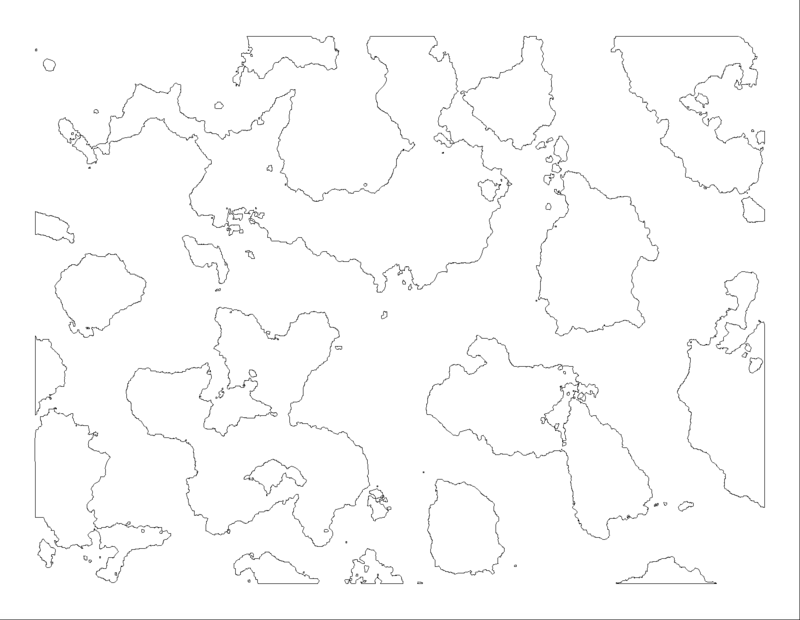 So, here is part 1 of my map for the continent (as yet unnamed) for Imaginary Atlas. Now, of course, this is still early in the development process. There’s lots of work left to do, but it’s a start. 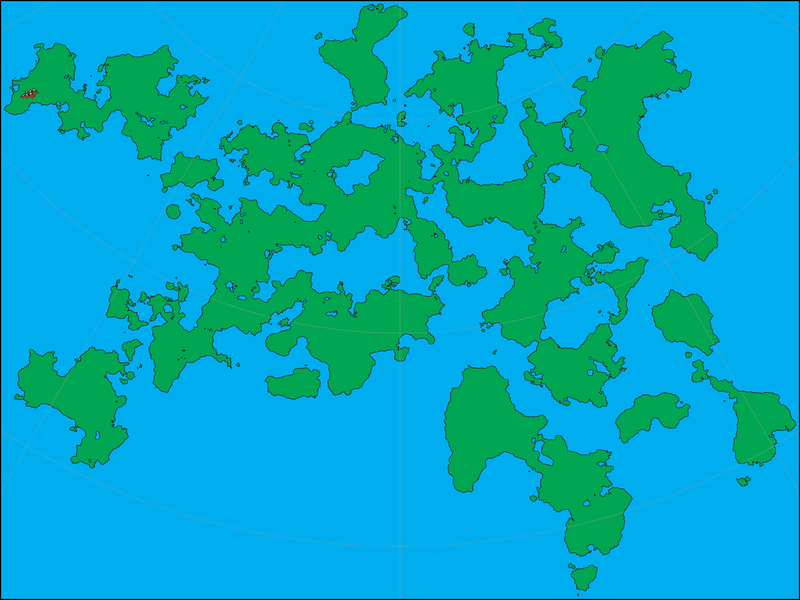 So, you may be asking, how is it that you draw these fantasy maps of yours? Funny you should ask, as I’m about to tell you. I started with a Photoshop file. I set the size to fit on a standard 8.5 inch by 11 inch page, with a half-inch margin, which makes the image itself 7.5 inches by 10 inches. (Actually, I use picas for measurements for things like this, because I’m an old-school print shop guy, but that’s neither here nor there.) The resolution I used was 150 pixels per inch. I could have gone 300 ppi, which is magazine print quality, or I could have gone 72 ppi, which is screen resolution. I picked 150, though, because it seemed to give me decent results. I made sure my foreground color was set to black and the background to white. Then, I went to Filter > Render > Clouds. You’ll get a cloud-ish pattern, rather like this. Redo the filter (cmd+F) until you get a pattern you like. It doesn’t really matter at this point. Next, add a new layer above the clouds layer and fill it with some solid color. It doesn’t matter what color as long as it isn’t black or white or gray. I generally prefer some shade of blue. Either right click (opt+click) or click on the context menu on the Layer tab and select Blending Options. At the bottom of the window, you’ll see a box labeled Blend If with two color gray scale sliders in it. Grab one of the tabs under the Underlying Layer slider (doesn’t matter which one) and drag it toward the center of the slider. You’ll get something like this. When you get some shapes you like, flatten the image. Grab the Magic Wand tool and click in one of the blue areas. Go to Select > Similar to select all the blue in the image. Go to the Paths tab’s context menu and select Make Work Path. Set the tolerance as low as it will go, which will probably be 0.5. Go to File > Export > Paths to Illustrator and export the work path you just created. Open the file in Illustrator. You’ll probably see just a blank white artboard, but that’s OK. On the Layers tab, toggle the visibility (cmd+click on the eye icon) for Layer 1 (it should be the only layer you have). You should see the outline of the path you just created, like so. Select all (cmd+A) and give the path a stroke. Probably 0.5 point is fine. You’ll also want to set the cap and corner to the rounded options, but leave the align stroke option to centered. You can toggle the visibility of Layer 1 back to visible now. 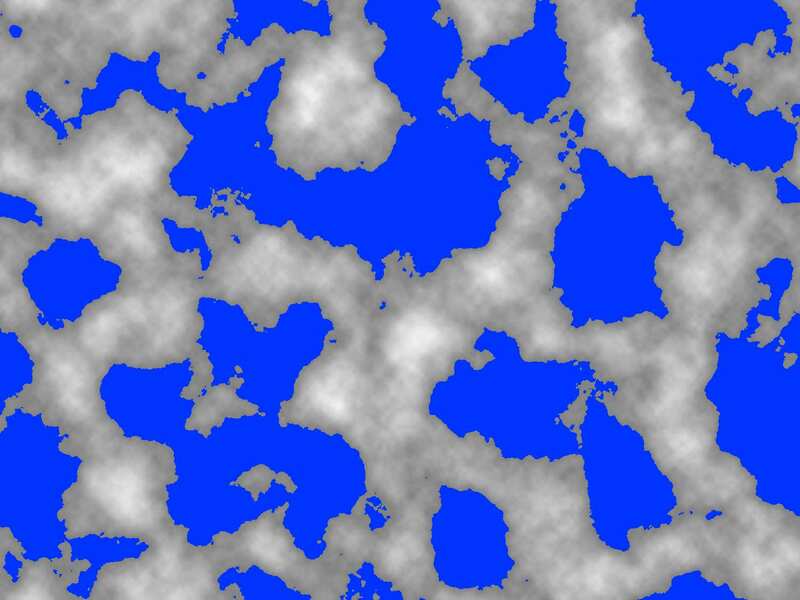 It’s unlikely that this process will give you a map you’d like to use by default. What you’ll need to do is to create another artboard (same file or in a new file), then select the blobs of shapes that you like, copy or cut them from the original art board and position them on the new one. You’ll likely also want to use the Pathfinder tools to merge some of the shapes to create larger, more intricate shapes. At some point, you’ll want to add color just to make it easier to see what’s land and what’s water. If you look at my first image above, you can see that it has a map projection grid of latitude and longitude lines. We’ll look at how to create these in the next entry.